Update Monday morning, Dec. 14: InMenlo weather watcher Bill Russ found another .15″ in his backyard gauge, bringing the season-to-date to 4.6″. When we were walking between 1:30 and 2:00 pm along Bay Laurel in Menlo Park (photo right), skies were blue and only an occasional gust of wind was there to remind us of the morning rain. But shortly after crossing the pedestrian/bike bridge over San Francisquito Creek, the sky darkened, and by the time we hit Oakwood apartments it was pouring again! 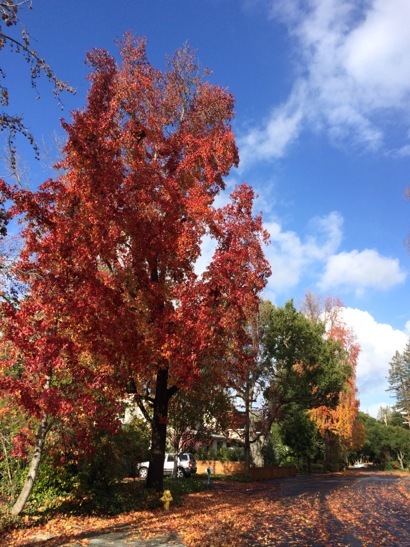 That echoes InMenlo weather watcher Bill Russ’s report sent at 2:30 pm: “More rain may fall. I hear it on the roof right now, but I’m going out and won’t be back until after dark. “So my report is .65”. My season-to-date total is 4.45″ A year ago it was quite wet, and my figure was 10.95″ as of this date. “From late december through the rest of the rain year we had about 7”. For the rain year 09′-10′ when we were over 20″, the amount was 4.4″ as of December.